You can now buy your Bruson and Savoleyres ski pass and we will prepare it for your arrival. 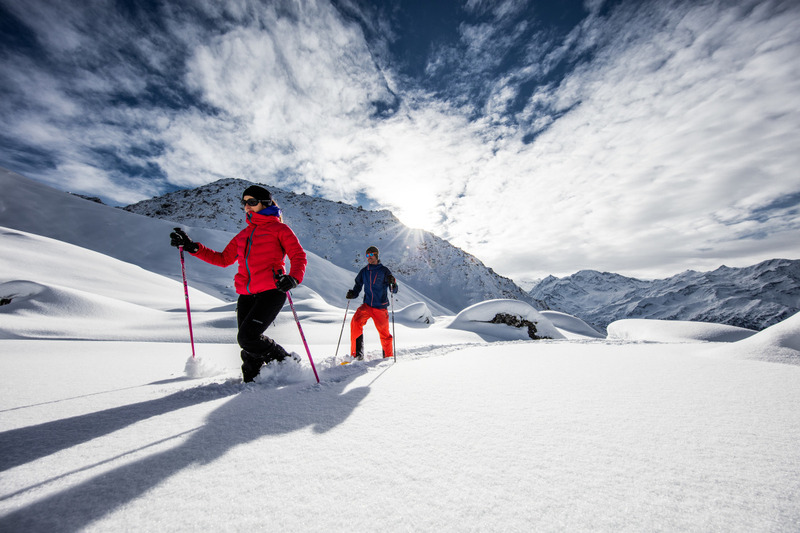 You can choose from our two pick-up destinations, either our main ski rental shop in Ski Service shop in Verbier or at the Una Lodge in le Chable. Bruson is one of the smallest and most idyllic resorts within the 4 Vallées. 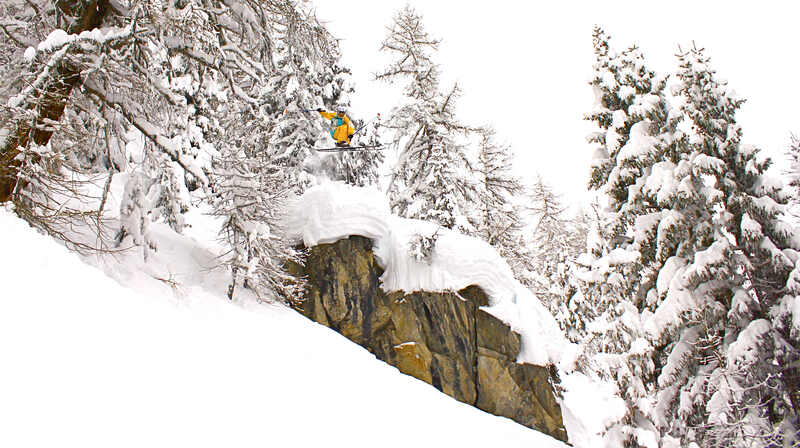 Surrounded by forest, the quiet resort gives wonderful views of Verbier and excellent tree skiing. For skiers looking to escape from it all, Bruson is where to go. With a nice selection of blue and red slopes Bruson is great place to get off of the beaten track. Savoleyres sits above Verbier and looks over to the main resort. With both East and North facing slopes you're guaranteed to always find good snow. With a great selection of blue and red slopes Savoleyres is perfect for beginners or skiers looking for a relaxing day in the sun. Stretching from 2300m down to 1500m Savoleyres goes from alpine terrain all the way down to the forest of La Tzoumaz. With the Bruson and Savoleyres ski pass you have access to Bruson and Savoleyres. This is a great ski pass for those looking to get off the beaten track. 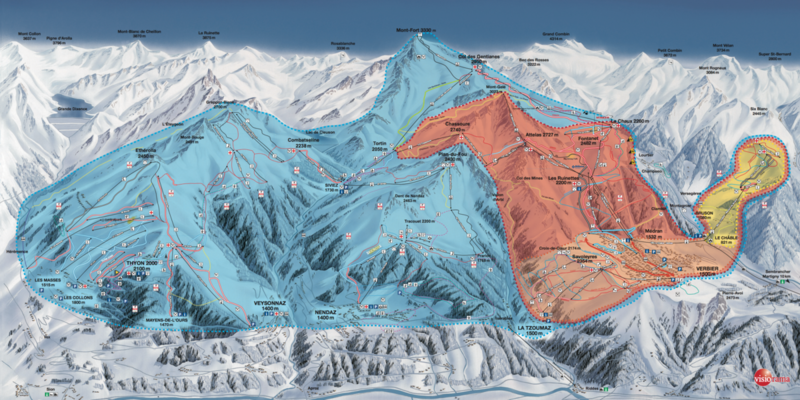 The skiing area is split into 3 different passes, the Verbier Pass (marked in red on the map), the Bruson and Savoleyres ski Pass (marked in Yellow on the map), and the Verbier 4 Vallées Pass (marked in blue on the map). You can now book your Bruson and Savoleyres ski pass and skis with Ski Service online and save up to 20%. Click here to find out more about our ski hire. Are you coming to Bruson but not planning on skiing? Worry not, you can still make the most of the beautiful snow capped mountains. 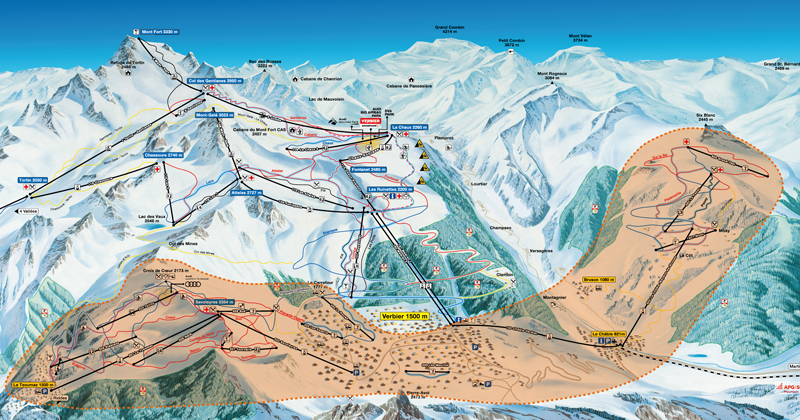 You can purchase walking passes for the 4 Vallées which allow you to visit all the best spots via the lift system.